If someone asked me if I wanted something red about a month ago, I'd say, "yes, I'll have the Merlot." But now that I have finished this cardigan, Something Red has a new, entirely different meaning. So does the whole "cardigan" thing. Normally, I wouldn't grab a cardigan, unless, of course, it is in a fine gauge yarn that could be tied around the neck to add some sass, (or is a bit shrunken). You know, something you could wear with a matching little shell. Or with an Audrey Hepburn face and hair and pants and shoes and, well, you know. But the Something Red. 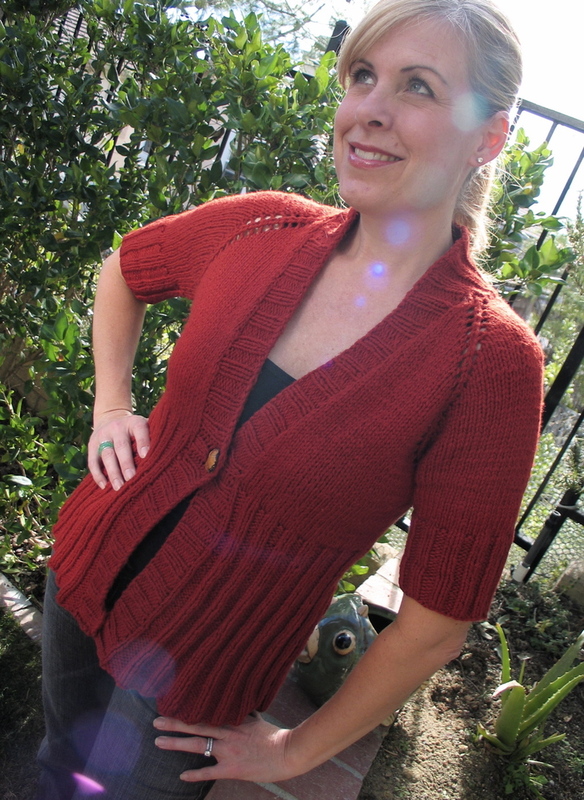 This cardigan has short row shaping up and around the neck so it curves ever so slightly. And the ribbing at the waist flares "just so." Instructions for longer sleeves are included. It's so cute, Wendy. Perfect for Spring....maybe my next project??!! I love the knitted skirt too - I think it'd look great in a tartan stitch. So cute! Perfect for the warm weather we have plenty of in SoCal. Wow! I love it! I just lose steam to quickly on garments. I wish I could love making them. It's purty though! Oh, yes, jaunty look might be lost with long sleeves. I think you're right about that. Of course you are. Thanks for your quick response, AND for visiting my blog to answer my question directly :). And how did I miss that chair, I love it, new? Love it Wendy! As usual, a super spectacular pattern. Pretty! Buying it now! Thanks Wendy! Got it! Love it! Hope it will look good on a 45 in. set of twins! Just bought the pattern! I love it and I've been wanting to knit something I could wear in a business casual environment and still look a little hip. You are awesome...keep the designs coming. I'm off to kpixie to check out the colors of BSky cotton. Thanks again. K&T pattern by far - what a success! Oh and congrats on joining Garter Belt! What fun news to share. Wendy, you did it again! I am off spending more money...good thing I promised to be on a yarn diet not pattern diet! Love it, love it, love it! GASP so cute, Wendy!! It turned out awesome. Oh, and you look really cute in the second picture! Lizbon, Si! (well, in these parts, "si,') I guess I could also say "OUI"! The red cardi looks fab! Rock on, I love the subtlety of the collar. Darrrrling! I love that you knit it in BSA cotton, I'm totally loving that yarn right now, it's nummy! This is yet another good one, you're on fire. BTW, I finished my swing coat tonight, I'll be posting photos tomorrow, it came out great and I didn't mess it up, YAY! Thanks a ton for your help and encouragement. Wendy! I've got to knit this and in Tomato too. I would like mine with long-sleeves or maybe 3/4 sleeves with long ribbing but guess what, kpxie has only 5 skeins of Tomato left, just enough for the short-sleeve for the smallest size but I ordered that anyway. Looks like another winner, Wendy! Congrats! And about that skirt from the previous post - a friend test-knits for that company... She said she wouldn't recommend making it. Just FYI. Love it! So perfect for spring. Cute, cute, cute! I love the shape - your designs always rock, Wendy! I would love to have different sleeve lengths too! I have already purchased the pattern. Would you send out a revision? Thanks Wendy. I'm lovin' something red!